Be sure to add me to your favorites. Parts Timepieces Craft Art watch. Repairman estates and material house. Findings from 40 years travels around. Check out my other items! SCROLL DOWN BELOW LISTING. TO SEE THE 24 PHOTOGRAPHS. PHOTOGRAPHS REMOVED DUE TO. NEW E BAY POLICY, SORRY, BIL;L. For those who cannot and do not. Read a listing I have put the price. High enough that you will and do. IRON STAKES –BUT– SAME. RESULTS CAN BE HAD WITH. ROUNDED OFF ENDS AND. SANDED SMOOTH, JUST DID. NOT WANT TO MAKE THE. That are used to repair pocket. INSTEAD- most of what you. Need to do to remove dents. Can be done with wooden. 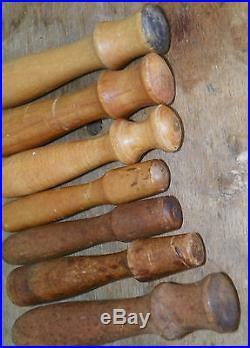 Dowel rods from Home Depot. Cut TO SIZE with the ends. Rounded off- A formica counter. 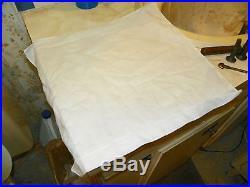 Top- A handkerchief- A used. 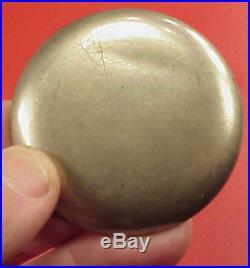 Plastic crystal- A small brass. Also in thrift stores. Are many small wooden bowls. And wood things that make. Good punches and some are. Shown in the picture I have. Found that work on certain jobs. Like rerounding a case back. 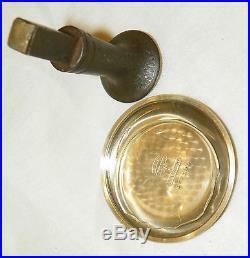 Opening or pendant tube. 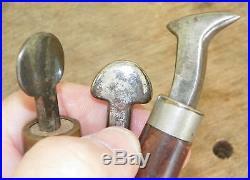 Tools in first 2 pictures are. Heavy steel case stakes. 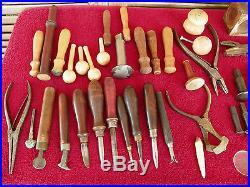 Bow pliers, wood blocks, 3. Special inside middle of case. Dent removal burnishers, 1. Special inside case file with. Scraper- the two headed small. Tool in the line up, several. Regular burnishers, hunting case. Spring pliers, Bronze wool- a. Secret of the TRADE instead. Of steel wool etc. FINE not Medium like HOme. Inpregnated paper from craft. Store- for the finest finish. From Sams Club or. Formica has some give or. Bounce to it so the hammer. Blow is not to stretch the. Metal but to spring it back in. Pink dish detergent is. To use with water and the. 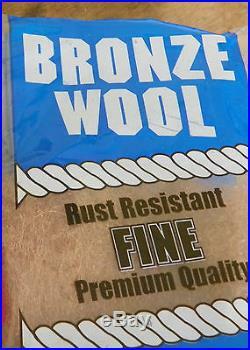 Bronze wool to remove most. Of the signs of the hammering. From inside case back after. Piece of very hard ¼ inch. Is placed between case dent. And punch- Now punch does. Not leave marks- The crystal. Will break away as time goes. On- but works very nicely leaving. Dents are being removed from. 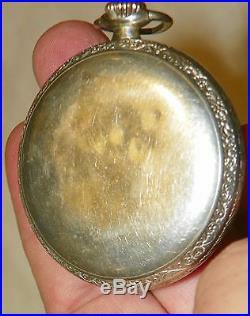 A nickel silver 16 size back. With small round deep dents. And general all over ripples. And a crease in an 18 size nickel. Case is the same operation but. Some gold filled is hardened. And works just like nickel and. Some is soft and stretches. And makes a bump instead of. Springing back so for each. Hit you get a new bump if you. Hit to hard, like later 992b s. Similar: Some silver cases are. Soft and thick and some are. Brittle and can crack if hit to. Often, hitting silver hardens it. Also and makes it brittle. The 16 size case back is full. Of ripples and deep dents and. Took a lot of hits all over and. Over and came out pretty good. But I had to use emery paper. To smooth it off and a buffer. With rouge and wax for a. Lubricant to smooth it out and. Then the fine ruby impregnated. Paper to take the swirl marks. Out by making finer marks but. In a straight line not swirls or. What is called a butler back f. You have to want a case. To take this much time to do. This- say an hour. The 18 size back with the. Ripple took 4 hits with the. Small iron stake, plastic crystal. In between it and back and. Plastic crystal broke a few. Small pieces off but crease. Came out nicely, then rub with. Bronze wool inside case back. And remove marks and looks. Harder: as you cannot buff or. Grind out the signs of hitting. Dents but can clean the inside. Case back up nicely, so be. Careful on chrome cases, hit. To hard and it stays that way. Unless your thumbs can press. It back a little in place. Practice makes nice work. And you feel good. 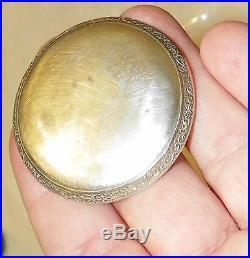 The item “Vintage Pocket Watch Case Dent Removal Easy Way Low Cost Tools Information Only” is in sale since Saturday, October 24, 2015. 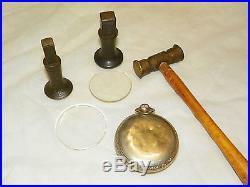 This item is in the category “Jewelry & Watches\Watches, Parts & Accessories\Pocket Watches\Tools & Parts”. The seller is “partimeart” and is located in tampa, FL. This item can be shipped worldwide.